The one true King of Rock and Roll is Elvis Aaron Presley (1935 - 1977). Born in Tupelo, Mississippi, Elvis released his first album before the age of twenty, and by twenty- one had recorded his first big hit, "Heartbreak Hotel." In 1956, Elvis began his Hollywood movie career with Love Me Tender, and from there, the sky was the limit in terms of his star power. My personal favorite of his films however, must be King Creole (1958), a kind of noir/musical co-starring Carolyn Jones as a sexually-ravenous femme-fatale. One of the most beloved figures in American pop culture, Elvis -- as a character, not the actual performer -- has frequently appeared throughout cult-TV history. Or, in other scenarios, he is worshiped as a deity-like figure by characters in popular programming. 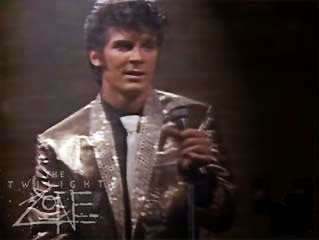 On the CBS remake of The Twilight Zone (1985 - 1987), an episode titled "The Once and Future King" found an Elvis impersonator, Gary (Jeff Yagher) traveling back in time, and accidentally killing Presley. Then, he replaced Elvis, and lived his life...much to his chagrin. 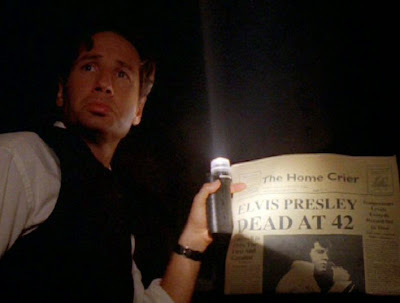 Among Presley's fans in cult-TV are Fox Mulder on The X-Files (1993 - 2002), who takes a pilgrimage to Graceland in the episode "Never Again," and Bobby Munson from Sons of Anarchy (2008 - 2015), who moonlights as an Elvis impersonator. In an alternate world seen in Sliders, Elvis lives well into the 1990s, and performs in Vegas as old, fat Elvis. 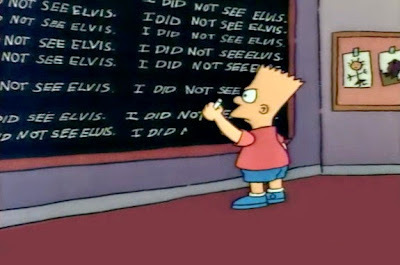 And in Futurama (1999 - 2013), we see that Elvis's legend lives on to the 30th century. His pelvis is on display at (Forbidden) Planet Hollywood. 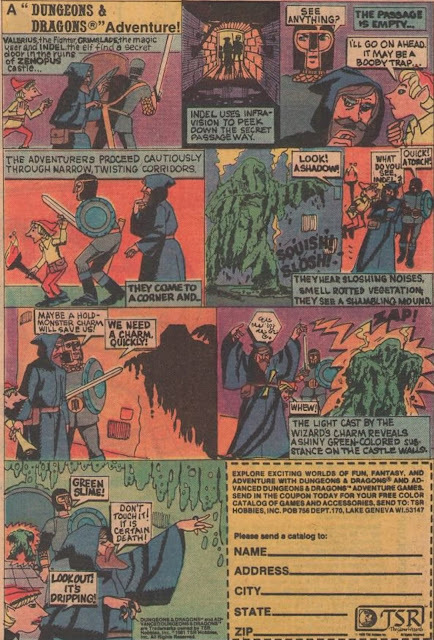 That Twilight Zone episode was top notch. A sad tale of how you can't change time and or destiny.